What is a List of Low Glycemic Foods? The glycemic index of foods is a calculation of ranking foods and how they affect blood sugars. Diabetics especially want LOW GI foods. It’s important to know which foods are good or bad when it comes to blood sugar levels being affected. Foods fall into three categories when it comes to their affect with blood glucose levels. There are high, medium, and low glycemic index foods. It’s very beneficial as a diabetic to follow a low glycemic diet because the results can be a lowering of your risk for heart disease, losing weight, and of course lowering your blood glucose levels which is crucial for controlling your type 2 diabetes. If you know anything about diabetes, you know that when consuming carbohydrates, it’s up to your digestive system to break them down into simple sugars that will enter into your bloodstream. There are different kinds of carbs that have distinctive effects on your blood glucose levels. That’s where the glycemic index comes in. Different foods have their own unique rate at how they raise your blood glucose levels in comparison to absorbing 50 grams of glucose, and this is used as a particular food that is a reference and has the GI value of 100. 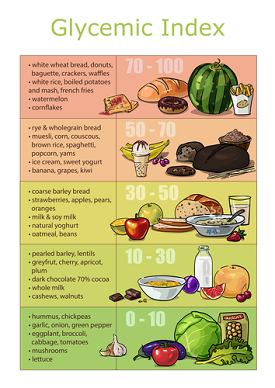 Note above how the different levels of glycemic foods are categorized. You obviously want to have foods that are low and in the 55 and under “low” category. The reason is simple. These foods are more slowly absorbed and digested. The result is they cause a much smaller and slower rise in your blood glucose levels. This is exactly what you want when you have type 2 diabetes. On the opposite side, you should avoid foods that are on the list of high glycemic of 70 and higher. These get digested and absorbed very fast and this results in a much quicker raising and dropping of your blood glucose levels. It’s important to note that only carbohydrate foods have GI values. *Cancer- By following a low glycemic diet you run a lower risk of some cancers such as: colon, endometrial, and breast cancer. So it’s advantageous to avoid the high glycemic foods. *Weight loss- There have been studies on low GI diets in regards to weight loss. In a five to ten week study, the results of healthy adults were that they lost between 1-4 pounds. *Cholesterol- You can improve your cholesterol levels on a low GI diet. Results have shown that LDL cholesterol can be lowered by almost 9% and total cholesterol lowered by almost 10%! This surely has positive effects against having a stroke or heart attack. So this is another great reason to only have foods that are low GI. *Heart disease- Other research performed showed that folks following a high GI diet had more of a 25% chance of developing heart disease compared to those folks who were on the low glycemic index diet. Keeping with the Low GI foods is always going to be the way to go. It will help keep your heart healthy. It’s common sense. So we are all different when it comes to different blood glucose levels and how we process the glucose. The fact is that your body can handle glucose much better when your numbers are in the normal range. If you are insulin resistant, prediabetic, or currently have diabetes, then is even more critical. While you want to be sure that you’re consuming foods in the low end of the glycemic index chart, it should be noted that the GI does not account for the portion size that you have. How the GI is calculated is that your blood sugar gets raised by not only what the level is but exactly how much food you are eating at the time. So in light of this a new rating was established called the glycemic load or GL. What the GL does is it takes into account the amount of grams for each serving and the level of GI of the carbohydrates as to how they affect blood glucose levels. The GI is more important than the GL, but you should still keep an eye on your GL according to the Glycemic Index Foundation. The foundation recommends keeping your GL under 100 each day. These are the foods that are going to help you with your blood sugars and diabetes! 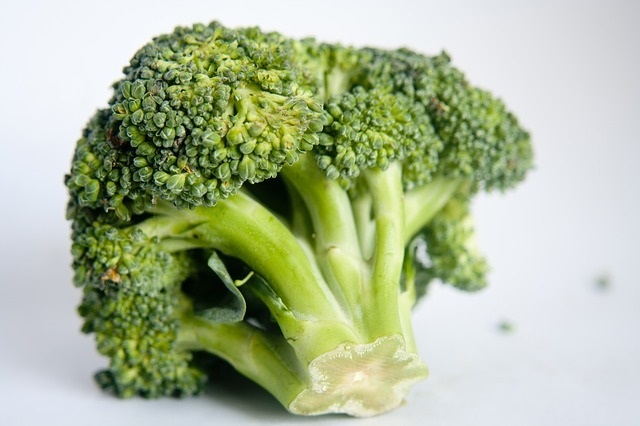 *Broccoli- GI:10- To me this is a superfood and perhaps my favorite vegetable. It can help to prevent cancer and has anti-inflammatory properties. You get plenty if minerals and vitamins and fiber as well. *Peanuts- GI:13- We all like to snack but it always has sugar,right? Forget the sugar. It’s a killer! Well peanuts are a great choice for a snack and they are low with a count of 13. *Tomatoes- GI:15- I love tomatoes and at a rank of 15 they are another great choice for a low GI food. They also help in the prevention of cancer and heart attacks. *Mushrooms- GI:10- Mushrooms are extremely beneficial for you and can also help with their anti-cancer properties as well as keeping your glucose down. *Apples- GI:34- An apple a day keeps the doctor away as they say, right? Apples can also provide you with loads of fiber, vitamins, and minerals. They are low in fat and calories and help to fill you up. Wash and eat. How much easier can it get? *Beans-GI:40-52- The GI score depends on the particular bean that you have but they are all on the low side and are healthy. Black beans are extremely healthy for you. But any beans are great for lowering your blood sugars! *Strawberries-GI:40- These are another favorite of mine. They may not be as low as other fruits when it comes to GI and sugar, but they are still beneficial as long as you don’t overdo it. They are packed with antioxidants! *Cherries-GI:22- Cherries are low in fat and calories too. They provide Vitamin A and Vitamin C and are great for blood glucose and helping to prevent gout. *Oats-GI:51- Oats are another awesome choice to keep your blood sugars down and keeping them stable. They aid with lowering your blood pressure and your cholesterol levels. *Kale-GI:3- Okay, this might be the ultimate vegetable when it comes to your blood sugars and overall health. With a glycemic of only 3 there’s never a concern for your blood glucose raising at all. It provides a ton of Vitamin A and Vitamin C and potassium as well. Of course, kale has few calories and fat. *Grapes-GI:43- They do have a sweet taste to them and they are still on the low GI list with a rank of 43. Grapes are a fruit that you don’t want to overdo. What is a list of low glycemic foods? I hope that I’ve provided you with enough information to help you. Following a diet that is low glycemic can be very healthy and good for you if you have diabetes. But the thing is that it’s not perfect. You still must be cautious about what you consume. It’s very wise to discuss this with your physician first. The low GI diet has great benefits including, losing weight, cutting your risk of heart disease, and type 2 diabetes, and of course lowering your blood sugars. That’s what it’s all about! Reverse Your Type 2 Diabetes Below! Please forward this article to others who may need help and please leave any questions or comments you may have below. I would love to interact with you. Thank you for reading and I appreciate it! Have a happy and a healthy one! Very detailed information! I learned a lot from this. There are foods on the list that I’m pleasantly surprised by. If I centered my diet around tortellini and ravioli, as well as vegetables, would that be effective? Are there other things I would need to take into account? Hi Jason, The foods on the list are a generalization. But the vegetables for sure will be effective for diabetics. Choosing foods from the low glycemic list is a start. By adding exercise is something that will affect diabetes in a positive way too. It doesn’t mean that you can’t have other foods even on the medium or high glycemic lists. They are ones that you should have in moderate or low amounts. This is indeed a very detailed article, and I really agree on the fact that foods with a low glycemic index are beneficial. Honestly I actually didn’t know how important it was until I read this . I love how you took the time and effort to list a lot of foods that are low in glycemc index, and how you even went further to talk about a couple of them. Thanks for writing this. Thanks so much for sharing. It was really helpful!! Thank you so much! Yes, it’s not only the calories to be concerned about with putting on weight. With diabetes you don’t want foods with high glycemic index because of the sugar content. With diabetes, you want to have food that has a glycemic index under 55. Most fruits are low especially berries, but there are some fruits that are actually high so you must be careful. Once you know what foods are low, you can stick with them and avoid the higher ones. As a type 2 diabetic I am always looking for articles with advice and tips just like this article has. From what I learned, your details are right on the money therefore it’s great advice. A big thing with diabetes and losing weight and everything else is portion control. I have bookmarked your site because I love the info you provide. Thank you. I’m like you. I am always looking to learn more about how to treat diabetes and how I can lower my blood sugar. You always want to eat foods with a low glycemic index because they have the least amount of sugar. But you’re correct. Portion control is of the utmost importance as well. The more you know and follow the more successful you’ll be in fighting and controlling type 2 diabetes. Thank you for this article loaded with detailed information about diabetes and foods. Most people know that when you are diabetic there will be restrictions as to what foods you are supposed to consume and in what quantities. Even when fruits and vegetables are generally considered healthy, there are still those that a diabetic patient should not eat or even they can, they should limit the amount. But I never actually thought there is such a thing as “low glycemic foods” or low glycemic index. I was at the supermarket the other day with my colleague and we were just talking about how bananas (55 GI) and grapes (52 GI) are not recommended for people with diabetes because they have high sugar content. Then she said that even apples are included in the list of fruits containing high sugar. That was the first time I heard about how apple is also considered high glycemic food. However, on your list, apple only has 37 GI. I wonder where my colleague got that information. Fruits and vegetables are generally healthy. Fruits do contain sugar but as long as their GI number is less than 55 they are good for you. Bananas and grapes are a little on the high side, but as long as you don’t eat too many you should be okay. But berries are the lowest on the glycemic index scale to eat. Apples are not too high with a GI of 37 unless you eat a large sized apple the number could be higher. I never realized that certain “health foods” such as brown rice or wheat bread where not beneficial to someone who is diabetic because of its high glycemic index. Is the instant oatmeal not good as far as glycemic index because of how it is processed and packaged? How do I get my dad to eat more of these foods? He’s diabetic but doesn’t like these foods listed as much. Certain foods are not healthy to diabetics because of their high glycemic index score. You have to be careful about sugar content which is why the glycemic index was invented. Instant oatmeal may not be as good as oatmeal because the glycemic index is 55 and above. I’m not sure how you can get your dad to like anything but as a diabetic he should only be eating foods that are under 55 on the scale.